At last I have conquered this warp and am finally having fun! Since this is plain weave, weaving is super fast! The bookmarks will be fringed, and you can see in the photo on the left that I'm using card stock in between each bookmark to allow for that. For the weft, I'm using the same black that I used at the edges. This way the weft thread isn't noticeable at the selvedges. ...... before throwing the next shot . 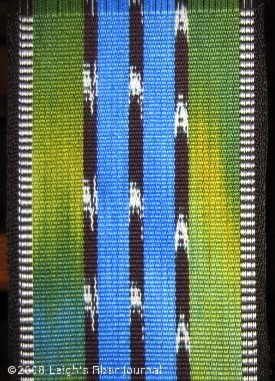 ....that on the left, the white warp is on the top, while on the right, it's the black. This doesn't effect the horizontal stripes any, but it would be distracting at the fringe. This happened because I didn't pay attention to thread the odd and even shafts with the same color on both sides! 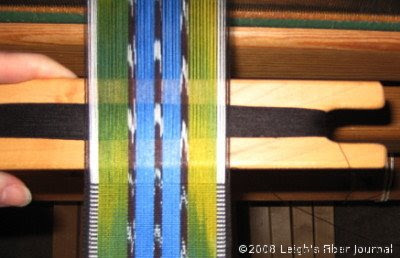 I ended up unweaving this bit and rethreading the black and white warp on the left side. Once all the blacks were on odd shafts and the white on even, the two sides looked the same. I don't anticipate that finishing up this warp will take very long. I should be on to the next project after the weekend. The colors are coming together great! I'm still awestruck over the 105 ends per inch!! I didn't notice your "duh" until you mentioned it and I look at the closer picture. Nice colors!!!! I really like it. I also didn't notice the duh until you mentioned it. I'm glad you all like the colors! I kinda got stuck at 105 epi. In fact, I had a very hard typing it. I didn't know that was possible - fanny self with magazine. Wow, Leigh, that looks fabulous! I still haven't progressed beyond winding the warp bouts, so I'll just sit and admire yours. I'm glad you're enjoying Ikat! 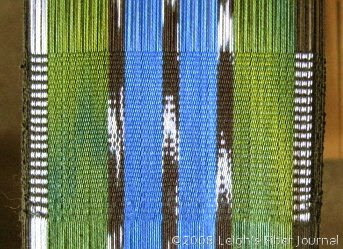 Have you thought about applying Ikat to the weft at all, or are you just going to stick with the black? Sharon, like I said, it really isn't too bad with only 292 ends. That's somewhere in the neighborhood of the number of ends needed for a dishtowel! Cally, I have to warn you that once you start it will be hard to stop! Amelia, jump on in, the water's fine! Hi there. I just saw your comment on my projects page. Comments were not turned off on the main blog but there might have been some technical difficulties along the way (Blogger can be that way). Thanks for dropping by! Beautiful! I like the re-thread of the borders too :). Leigh, these are going to be just lovely! The combination of the ikat and the painted warp is just stunning. You have such a great eye for color and design. Brava! What an antidote to dull winter colors! This lovely warp was worth the trouble you had getting it on, I think.